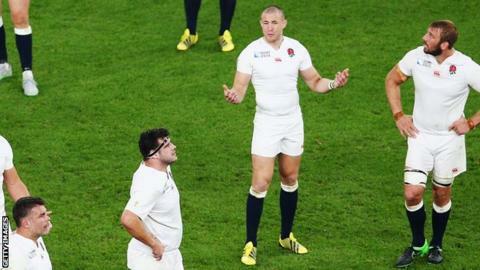 England full-back Mike Brown remains driven by World Cup disappointment as the side return to Twickenham for the first time since the tournament. The hosts were eliminated at the group stage after a 33-13 defeat by Australia in October and face Ireland at home in the Six Nations on Saturday. Harlequins' Brown, 30, said "something as big as that" is hard to forget. "I will always have it there at the back of my mind to motivate me even more," he told BBC Radio 5 live. "Every single day, every time I am training, every time I'm playing, every time I'm lucky enough to pull on a white jersey." England have won their opening two matches against Scotland and Italy and top the table, while Ireland have lost to France and drawn against Wales. Wasps' 23-year-old centre Elliot Daly has been included in the match-day squad for the first time and is set to make his international debut off the bench on Saturday. "He's come in full of energy, he's a great lad on and off the field," Brown said of Daly. "He's been a brilliant player in the Premiership, so it will be interesting to see how he makes the next step up. "It's always exciting to see these young lads coming through, but for me it's about setting a good example on and off the field in the way I train and play." England have been warned by head coach Eddie Jones that Ireland represent a far stiffer challenge than Scotland and Italy. "We definitely know we have to keep stepping it up," Brown agreed. "Training has been good, confidence is building, so we are in a good place."